Mr. Pirate has always enthusiastically supported my many hobbies, quilting being the most long-lived. I would make quilts for gifts and after many, many gifting occassions, he'd say .... "I see you making quilts but I don't see any around the house" Ooooops. Perhaps I had taken advantage of his good nature. We like to tent camp. As we set up camp, I'd spread out our sleeping bags on the air mattress and he'd comment .... "*this* is a proper quilt! It has a zipper!" I would thrash him about his head and shoulders. But his comment about *my* quilts missing the essential zipper component stuck in my head. 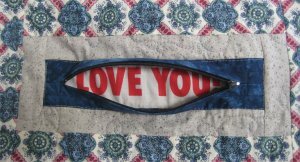 Over the years, I would think about how best to incorporate zippers into a quilt without being obvious about it. I wasn't going to put a zipper around the perimeter, because if he wanted THAT sort of quilt, he could jolly well buy a sleeping bag! No, the zipper quilt I would make for him would be subtle. The idea just kept simmering on the back burner of my mind. I was always subconsciously looking for a pattern that would accommodate a substantial amount of zippers in a clever way. It wasn't until February of 2011 that I *found* the pattern! The design team of Me & My Sister had come up with their pattern, "Rolling Pin". It wasn't *designed* to use zippers, but I could instantly see its potential. My sewing room has, over time, become the de facto family room. I have a TV & a boom box. I have lots of light and a big cutting table. Everyone liked to congregate there while I was sewing. :-) The cutting table was used for homework, laptops, and dinner. 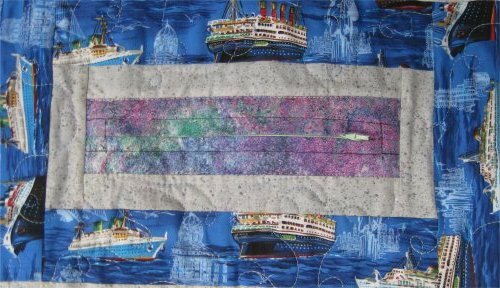 So, it was that Mr. Pirate would be sitting at the cutting table, watching TV and I was busily pulling fabric for his zipper quilt, literally behind his back! I was pleased to have enough of certain fabrics that are significant to Mr. Pirate. Mr. Pirate is a computer geek. He has a Bachelors of Science degree in Computer Science and has worked programming and beating computers into submission since the 1970's. Mr. Pirate has occasional obsessions. For a while, he was completely engrossed with the Titanic. He has amassed quite a resource library of information on the ship. Amazingly, he *remembers* all of that information! Mr. Pirate's family and extended family own some acreage in California's Napa Valley. This is prime wine grape growing land and that is what they do on that acreage ... they grow grapes that they then sell to wineries to make wine. Little known fact: wine grapes are LOUSY eating grapes. Ick. 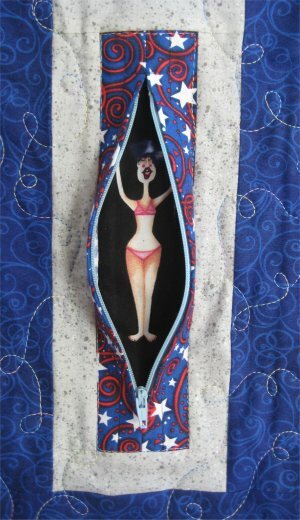 For a different project, I had bought an "old lady pin-up" fabric. That project died a quiet death but the fabric lived on. I realized that the rectangular pin-up ladies would be a *perfect* insert for the zipper blocks! The fabric would be horribly fussy-cut (the remnants hardly big enough to be called a scrap) but it was too good of a design factor to pass up. Finally all the blocks had been constructed and squared up. In order to sew them into a top, I needed to put all the blocks up on my design wall to ensure that the orientation was correct. I didn't want Mr. Pirate to see the blocks on the design wall because he just might notice the zippers. I needed to wait until he was away from the house. My opportunity came the next month, in March ... he had a client meeting. The minute he cleared the driveway and I was certain he wasn't returning for something he'd forgotten, I whipped out those blocks, slapped them up on the design wall and it was race-race-race! ... who would finish first? Me with the blocks sewn together or him with his meeting? I have never EVER sewn blocks together so fast in my life. First I chain-sewed the blocks together in columns. When all the columns were sewn, the chain-stitching threads were still holding them together in a loose lattice. This actually made it very easy for me to then flip the rows onto each other without worrying about getting one of them out of order. I was eager to start the quilting process and cross this long-time-in-waiting project off my list. But, I had a serious problem to overcome. Mr. Pirate is retired. This means he is usually at home all day long. To be sure, he's busy with his own activities, but he's *in the house*. 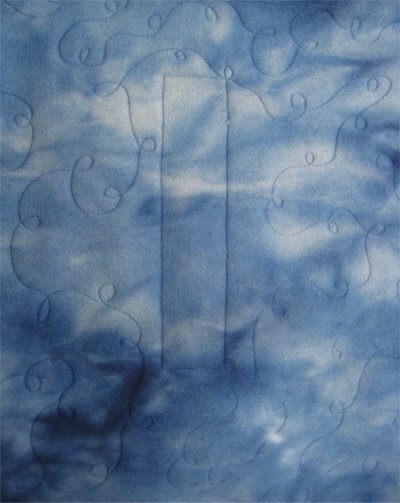 When I'm working on Lizzie (Tin Lizzie, my longarm quilting machine), he will wander in to see what I'm doing. I usually stop and show him what I'm quilting and how the quilting motif is done. If I had his quilt loaded, he'd see it ... I sure didn't want that! So, I had to WAIT for some event that would call him out of the house. It just so happened that in June, he started doing weekly bicycle rides with one of his older brothers. These bike rides usually took a couple of hours. I was very enthusiastic that he continue these bike rides, since not only was it a wonderful opportunity for him to do something with his brother ... but it got him OUT OF THE HOUSE while I could legitimately stay home! 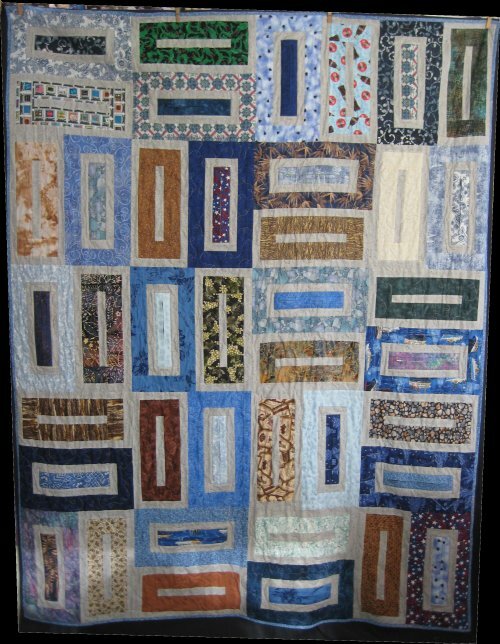 Due to the busy nature of the design and fabrics I used, I knew that any fancy quilting would be lost. And while Mr. Pirate appreciates the skill it takes to move Lizzie around and quilt nicely, he's just not into intricate designs. I figured some sort of embellished meander would be fine ... and a stitch in the ditch around the zipper segments to define them. 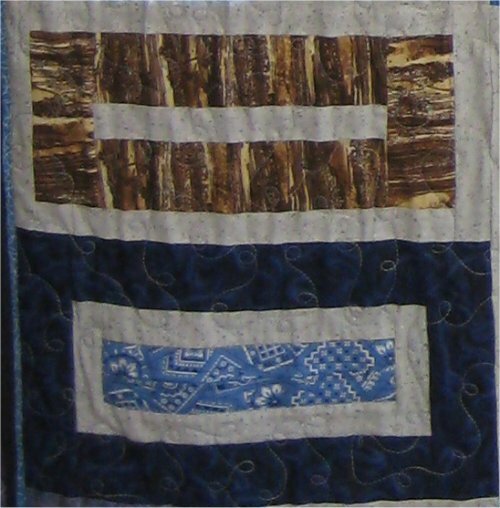 As always, there is a challenge of keeping the same sort of density with the meander quilting throughout the quilt. The embellished meander that I used is a loop/reverse loop design. I was able to use the time during another bike ride to make the embroidered part of the label with my Janome 300e embroidery machine. From "somewhere", I had picked up a ... wait for it ... zipper embroidery design! Sadly, I didn't write down where this design came from, so I can't direct you do the site. I printed out one of my "pirate persona" labels, wrote down the reason behind the quilt on it and positioned the embroidered zipper as though the zipper were unzipping the label. One more bike ride allowed me to sew the binding onto the quilt ... almost all the way around before he arrived back home. 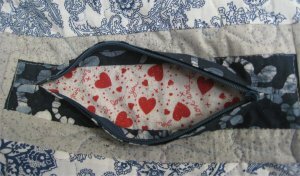 But by arranging the quilt "just so", I could have the backing side up whilst I finished the last little part of the binding and the part of the label that required hand-sewing. In my mind's eye, I had envisioned all 3 of our daughters being able to participate in the presentation. But, alas, it was not to be. They are also busy adults and I didn't want to wait until I could corral all 3 of them in the same place at the same time. So, I had Mr. Pirate sit down ... and he knew by the smile on my face that "something was up" ... and I went through a Readers' Digest version of how I came to make this quilt for him ... the zipper quilt!